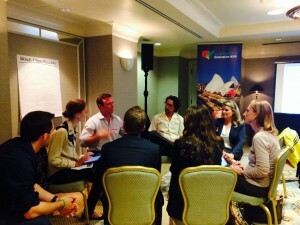 The ATTA planned a series of AdventureConnect events during April and May 2014. The idea was to visit cities throughout North America and deliver key news about the state of the industry and the latest research and trends. 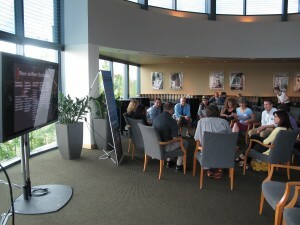 After a short presentation from ATTA staff, each event focused on a peer-to-peer exchange of ideas among participants. The West Coast portion of the North America “roadshow” included stops in San Francisco, Los Angeles and Seattle. Below are the highlights of each event. San Francisco’s AdventureConnect was held at OCSC Sailing School, in their meeting room overlooking the Berkeley Bay, and sponsored by Grand Trunk who gifted eight gear prizes to randomly selected attendees. Approximately 45 industry attendees represented a mix between long-time ATTA members and new faces to the growing community. Nicole Petrak, ATTA Research & Education Manager, provided industry updates including a sneak peak at new data findings from original ATTA research to be released this spring. Peer-to-peer sharing topics included Branding and Storytelling, Targeting Prospective Customers Online, Defining Successful Digital Marketing and Strategic Partnerships within/out the Industry. Liz Ferrin, Director of Strategic Partnerships at ATTA, hosted L.A.’s AdventureConnect at the Case del Mar Hotel. The event was sponsored by Destination New South Wales & Aircalin and there were lots of new voices to mingle with long-standing ATTA members. The peer-to-peer break-out sessions had to be abbreviated after pushing the allotted time limit, so that there would be enough time to report back to the group and stimulate further discussion. Michael Bennett from Muddy Shoe Adventures and writer Eric Hiss talked about the benefits of attending the Adventure Travel World Summit and hopefully we’ll see faces from the L.A. AdventureConnect in Ireland in October. ATTA partnered with The Florida Keys & Key West and Grand Trunk to bring the Seattle AdventureConnect event to the World Trade Center in downtown Seattle. 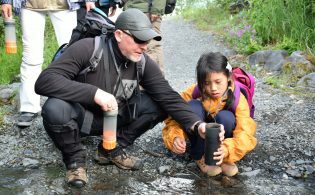 Attendees represented tour operators, recreational equipment and apparel companies, professional marketers and consultants and members of the press. A robust ATTA staff presence included President Shannon Stowell, VP of Marketing & Communications Casey Hanisko, Director of Community Development Alice Gifford, Member Advocate Sarah Earp and Office Manager Jessica Inge. Familiar faces were also seen during the showing of the “What is the ATTA?” Video as part of the industry briefing, since the video was filmed partially during an AdventureConnect Seattle event just a few months ago. Courtney Hans of The Clymb (and formerly REI Adventures) shared how she utilizes ATTA member benefits like educational webinars, research reports, networking opportunities and FAM trips like AdventureWeek to help business grow and shift according to customer demand. 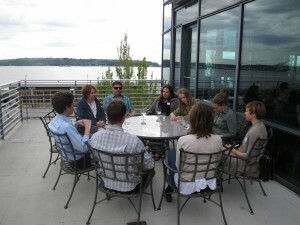 Overlooking Elliott Bay, participants shared knowledge in the peer-to-peer exchange and continued networking over drinks and light snacks, with some even carrying on to casual dinners in self-forming groups. Grand Trunk gave away door prizes including their signature travel hammocks, packable weight-bearing bags and more.